Size and Condition: A large example approximately 11 1/2 feet by 9 1/2 feet. Very good overall condition. The pile is mostly in very good shape throughout, especially the outer border areas and corner sections, save for some scattered areas shown in the latter pictures where it is either worn to the nub through heavier wear, and/or there is some random color corrosion commensurate with age. No apparent moth eaten damage but the fringes are trimmed where worn. 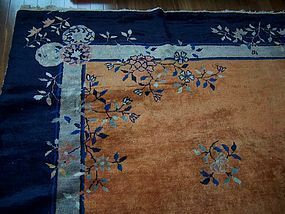 The rug would benefit from a proper professional cleaning but still lays very elegantly as is.